When you are looking for Tarpon fishing action in the Tampa Bay area waters, you need look no further. Capt. Jim is a native-born angler who has put his 25 years of knowledge and skills on the local waters to work, making him the choice of for sportfishing anglers from all over the world, fishing television producers, sports stars and celebrities seeking the saltwater thrills. Capt. Jim Lemke has been featured in many worldwide television shows like ESPN2 Inshore Angler and Urban Angler along with many local shows like Hooked on Fishing, The Average Angler and the 47 Fish Finder with many more. I will provide casting instruction on how to fish for the various species we will be targeting that day. So don’t worry if you are new to fly or Spin fishing for the mighty Silver King. It’s my job to help you along the way and teach you the right technique. I also provide top of the line 18 hpx Maverick skiff and a 23 custom Hammerhead Boat Works to be used on your charter like Maverick Boats, G-Loomis Rod’s,Daiwa Reels, Islander Fly Reels, and custom Fly’s by Ron. You are welcome to bring along your own fly rod, all I ask is to let me know what weight rod you are bring in advance so i can make sure it’s right for what we are fishing for. 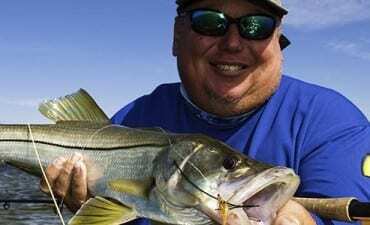 Captain Jim offers Inshore, Flats, and Backbay fishing in and around the waters of Tampa Bay, Florida. Some of the specie’s we will be fishing for are the mighty Silver King the Tarpon, and Permit. The Tarpon run in Tampa Bay from April through the first part of November with the best months are May through July on the new and full moons on the hill tides. Capt. Jim is experienced in many different angling methods, including fly fishing, plug, and spin, as required. To book a most unique fishing experience with Capt. Jim Lemke, contact him at (813) 917-4989 Cell or by email .